Saturday’s R2 of the Rolex Series in Mexico City was a support race to the second NASCAR Busch race in Mexico, and Marc Goossens was making his Busch debut – also his first race at the Hermanos Rodriguez circuit. Andy Woolgar has the news. Marc was driving a Robert Yates prepared Ford Fusion, backed by Citi Financial. He ran in the top five in the opening laps (behind Boris Said, Ron Fellows, Denny Hamlin etc..) and actually led the race for a couple of laps before making his scheduled pit stop. Unfortunately there was a miscommunication on that stop: the jackman dropped the jack but didn't pull it out in time and Marc lit up the tyres …. but hit the jack. He lost valuable time while they extracted it (nobody was hurt) and rejoined in 30th position. With 25 laps to go he clawed his way back up to 20th, then went higher still, to end the day in a very creditable ninth place. Denny Hamlin in his Rockwell Automation Gibbs Chevy eventually won, with Boris Said in an Evernham Dodge taking second. Marc acquitted himself very well and showed many of the NASCAR 'regulars' how to drive. One report of the race suggests that “the curve-filled, 2.518-mile Autodromo Hermanos Rodriguez road course featured eight tight turns and was especially tough for many Busch Series regulars used to negotiating oval tracks”. The stock cars were racing with a chicane in the main straight “to reduce accidents at the sharp first turn.” Jamie McMurray managed to hit this obstacle and returned to the track in front of one of Mexico’s favourites, Adrian Fernandez. The result was a damaged thumb for the Mexican. 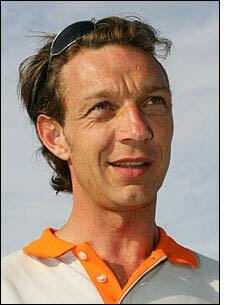 Michel Jourdain was another local to suffer at the hands of an American driver.